Last week I had the pleasure of helping some friends work in their parents garden not too far away. Tucked behind the house, the garden sits on a former house lot. When it came up for sale about five years ago, my friend's father jumped at the chance. Open land in Tokyo can be hard to find and expensive, but for a retired professional looking for a little spot to till in the city it was an opportunity to good to pass up. Now, it is a garden to envy. As we came through the gate rose, lily, and peony blooms greeted us with great shouts of color while rows of vegetables stood tidily at attention on the sunny center stage. Small fruit trees along with one of the biggest sansho trees I've seen yet stood quietly here and there. Near waist-high sweet corn, bushy young potato plants, cherry tomatoes, eggplants, and beans were preparing their summer fruits, while a handful of still quite luscious looking winter vegetables like komatsuna, mizuna, and kabu held one last row. The three of us spent a few hours weeding and tidying, and doing a bit of harvesting. One parent has recently fallen ill, hence the need for regular visits to help tend it. (Both parents are in their eighties but one would never know to look at them.) Just like it does when I pass through the gates at the farm, all sounds and feelings of the city were left behind. I heard only the scrape of the hoe as one friend cultivated, and another friend as she moved down the row next to me as we tied and clipped the spry young tomato plants. One vegetable - edible chrysanthemum or shungiku in Japanese - looked beautifully vibrant, but remained something of a mystery to me. I'd grown it as a winter green in my garden, but I'd not really known what to do with it. (It's is, by the way, one of those super-nutritious-easy-to-grow greens.) I'd just thrown it in salad as usual, but my sense was that there was great potential in those frilly leaved stems. And, my hunch was right! My friend's mother, a wonderful woman I enjoyed spending time with who also happens to be a fantastic cook, trimmed off a handful of stems on the spot when she heard I'd only eaten them in salad. Promising to make Goma Ai Shungiku (Sesame Seed Mixed with Chrysanthemum), she bustled back into the house while we finished up outside. Let's just say this dish opened a new window of flavor for my tastebuds. Sweet, salty, and tenderly crunchy stems and leaves dusted with sesame seeds came to the table, and I fell in love. I managed to not eat the entire bowl, but I did come away with a bundle of my own and her recipe. Bring a pot of water to a good rolling boil on the stove. Plop the chrysanthemum greens (whole) into the water, and boil for not more than a minute. 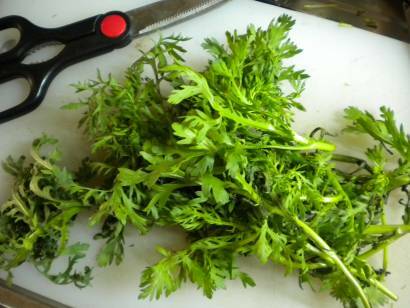 Drain as much excess water as possible out, then cut the greens into bite size or smaller pieces. Plop drained greens in a small mixing bowl. Sprinkle the sesame seeds, soy sauce and sugar over the top, stir. Eat. As usual, I've got a bundle of these. 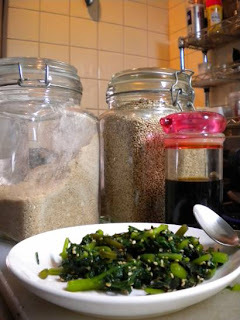 The amount of sesame, sugar and soy sauce is going to vary according to the amount of greens. My bundle was quite small as we're voracious salad eaters, and green things simply get gobbled up. (The top photo is the bundle before cooking, and the second photo shows the completed dish with ingredients.) The greens cook down quite a bit, so before making it for a party do a test run. Or just add small amounts and keep taste-testing as you go along. (Isn't that what we all do anyway?) It can be served hot, room temperature, or cold. I've now had it all three ways, and it's lovely. End up with your own stories to tell about this dish? Fill me in! Holy cow, Joan. This really makes me pine for Japanese vegetables. I'm glad to hear it, Russell! This one is easy to grow, and is fish free. It would make a seriously impressive potluck dish, I think, too. Thanks for reading! The garden sounds wonderful.. a bit of paradise right smack dab in the middle of the city. As for the recipe- thank you so much- I miss this!! The garden is quite wonderful, Anjuli, and I feel very lucky to have been invited along to share it. It is one of my favorite memories of living here. The recipe definitely needs tweaking, so I'd be glad for your thoughts, too. I made it last night and thought perhaps a bit more sugar would have been good.